Sevilla - Benito Villamarín 01.11.2017: After winning the vote to become hosts of the 2018 World Cup, Russia has been a hive of activity preparing for the tournament and most of the twelve venues are completely new constructions, spread amongst eleven host cities. The bidding process has varied considerably over the decades and not without some considerable controversy. Continental rotations applied and then pushed aside, numerous changes in bidding policy and practices; even the widely reported scandals that rocked FIFA following the most recent voting process to choose the 2018 and 2022 hosts. Whilst the 1966 World Cup was still in full swing in England, and with Mexico already selected to host the following 1970 World Cup, a FIFA congress met in London with the intention of planning far ahead for three further tournaments. Amongst the limited number of bidding countries, agreements were soon reached. West Germany would host the 1974 tournament, then Argentina in 1978, followed by Spain in 1982. Of course, following the end of a dictatorship and the return of democracy, much changed in the Spanish political landscape during the intervening years, but between 13th June and 11th July of 1982 with all the preparations in place. Spain hosted a truly memorable World Cup tournament at a total of 17 different stadiums in 14 different cities. Interestingly, only two of the stadiums were newly built, with projects aimed at making the most of the World Cup arriving in Spain, whilst the rest of the venues were existing stadiums that were upgraded. In this article, we take a closer look at five classic Spanish stadiums as they were at the time; some of which have since undergone extensive changes and upgrades, or don’t even exist anymore and have been completely replaced in recent years. Located in a city steeped in football history, the construction of the Estadio Ramón Sánchez-Pizjuán began in 1955 as a more fitting home for Sevilla FC and named in honour of their long-serving and ambitious club president of the time. Sadly, he died suddenly before the construction was completed in 1957, but his dreams and legacy live on to this day. Although the original concept was to build a two-tiered arena boasting a 70,000 capacity, work was scaled back due to economic restraints and when opened the capacity was 53,000 with only the two lateral stands featuring the intended double-tiers. It would take almost two decades and million more Pesetas spent for the intended capacity to eventually be reached. Plans ahead of the 1982 World Cup brought the next developments for this classic stadium. Along with upgrades to the cosmetic appearance and facilities, the most notable addition was the erection of a fully cantilevered roof over the Tribuna grandstand. This also required the construction of a supporting wall to carry the load, which was decoratively finished with the unique mosaic fresco by local artist and Sevilla FC fan, Santiago del Campo, featuring the traditional club crest surrounded by those of other clubs who visited the stadium. Somewhat surprisingly, this stadium only hosted two matches during the 1982 World Cup in Spain. The first was the opening Group 6 victory for Brazil against the Soviet Union, although the second was a more prestigious semi-final that produced one of the most memorable encounters of the tournament. Packed to the rafters, fans watched in awe as a thrilling game between West Germany and France finished 3-3 after extra-time, with the Germans eventually winning the penalty shoot-out. Since the World Cup and although the terraces have been replaced by seats, the classic design of the stadium has been preserved for future generations to cherish, albeit with a recent facelift. 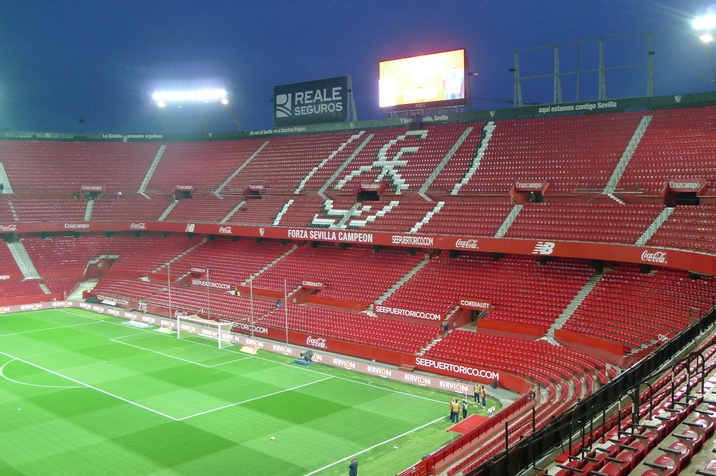 Cosmetic changes have been made over recent years to prominently feature the vibrant red of Sevilla FC, both inside with the seating and to the facias externally, accompanied by infrastructure and facility improvements within the existing structures. As suggested in an article by Spanish football newspaper MARCA, to this day the Estadio Ramón Sánchez-Pizjuán is one of the most difficult grounds for opposition players to play at, due to a unique and raucous atmosphere. The iconic San Mamés was built in 1913 and has been the iconic home of Athletic Club Bilbao for 100 years, bearing the name of a local church and fondly known as La Catedral (The Cathedral). Up until its replacement in 2013 by a magnificent new stadium bearing the same name, the original San Mamés held the honour of being Spain’s oldest purpose-built football stadium. During the industrial boom of the late 19th century, Bilbao attracted many migrant workers from Britain including miners and shipyard workers, who brought football with them and helped form the original clubs and the anglicised name of the city’s leading team is still retained to this day. Although England might be considered the home of football and founders of the modern game, much has changed over the decades. A sign of the times, perhaps, that according to an interesting article at Oddschecker, trends in football betting show that fans are backing longshot nations such as Iceland or Poland ahead of England to succeed at the 2018 World Cup in Russia. However, back in 1982 and having failed to reach the previous two World Cup tournaments, England had a very strong side when they headed to Spain. Given the historic roots of football in Bilbao at San Mamés, the city and its historic stadium were almost like a home from home and they won all three of their group games at the historic venue, including a memorable 3-1 victory against France. San Mamés had undergone extensive upgrades ahead of the 1982 World Cup, as both ends were rebuilt and connected to the main Tribuna grandstand, which retained its iconic arch above the roof, so it’s a shame the stadium didn’t host more than just the three games it did; all featuring England in Group 4 of the tournament. Opened in 1929 around the time of the Ibero-American trade fair in Seville and with an 18,000 capacity, originally named Estadio de la Exposición, the venue witnessed its first competitive football match with a friendly encounter between Spain and Portugal. Current tenants Real Betis Balompie are believed to have played some games there in the following years, but La Liga and Copa del Rey titles were won at their former ground of Patronato. Officially, Real Betis signed documentation to leave Patronato and make the permanent move to the renamed Heliopolis stadium on 15th July 1936, but just two days later, the Spanish Civil War erupted with fighting on the streets of Seville. However, when relative peace was restored in 1939, the club eventually began settling into their new home; albeit with crippling post-war debts. For thirty years the basic appearance of the stadium remained the same, until more substantial terraces were built behind the goals at either end in 1958. In the 1970s those same ends were rebuilt with the addition of filling in the corners, a second tier was added to the west stand along with a roof. In 1979 the east Tribuna grandstand was demolished and rebuilt, with a second tier and roof added in 1981 ahead of the World Cup. Despite the plethora of continued upgrades and improvements made to what was still known as the Heliopolis, like its neighbour across town, the venue would only host two matches at the 1982 World Cup and both featured a dominant Brazil side. The first was a 4-1 thrashing handed to Scotland, whilst the second was an equally convincing 4-0 victory against New Zealand. Since hosting those two World Cup games, the stadium has continued to undergo a metamorphosis. In the late 1990s, much reviled president Manuel Ruiz de Lopera wanted the stadium to be rebuilt and to bear his name. Two stands and a corner were rebuilt by the arrival of the new millennium, but spiralling debts halted plans and Lopera was no longer in charge. Only this last year has work resumed and a matching south stand been completed. It was an ambitious dream of shoe industry magnate and Elche CF president, Manuel Martínez Valero, that brought the World Cup to his small city. Almost a decade before the tournament was due to arrive in Spain, he planned the construction of a new stadium for his club, but it would be a project fraught with difficulties from day one. Elche’s old Campo Altabix ground was cramped and unsuited to a new development, so Martínez Valero bought land on the eastern edge of town. The local municipal council dragged their feet over granting permissions, refused to contribute towards the land purchase, and refused to allow the whole of the old Campo Altabix to be redeveloped and repurposed. Likewise, the Spanish government weren’t forthcoming with proposed financial grants. Despite all these initial problems, Martínez Valero stubbornly pressed on with his plans and construction eventually began towards the end of 1974. The initial phase provided a capacity of around 28,000 with an open lower tier, plus two lateral upper tiers with seating. Officially opened on 8th September 1976 with a friendly match between Elche CF and the Mexican national team. At last, the city was chosen as a host and government grants arrived for completion of the project. By 1978 and well ahead of schedule, the upper tiers at the corners and ends were completed to provide an impressive arena with a 53,000 capacity. Although the original name of Nou Estadio (New Stadium) was somewhat unimaginative, all the efforts had been worthwhile. The venue hosted three matches in 1982 and witnessed the remarkable 10-1 victory for Hungary against El Salvador; a phenomenal World Cup record in the finals that still stands. Since the 1982 World Cup and with the stadium bearing the name of the man who made it all possible, the same classic arena design remains. There have been various upgrades and improvements, with the conversion to all-seater reducing the capacity to just under 34,000 at present. Sadly, after a breach of economic regulations saw Elche CF administratively relegated from La Liga, the club has been in freefall and their magnificent home is now hosting matches in the Spanish third-tier. As Spain’s third largest city, Valencia was always going to be one of the leading venues for World Cup games in 1982. However, the home of Valencia CF and principal stadium in the city also needed extensive work to get it ready. Originally built in 1923 as Mestalla and since restored to that name, for a period after 1969 the stadium was named Luis Casanova in honour of the club president. When improvement work began in 1978 and impossible to extend outwards or upwards due to surrounding buildings, architects came up with an ingenious plan to meet the challenging demands they faced and quite literally, dug deep to provide the solution. Undertaking a considerable and complex feat of civil engineering, the whole pitch was excavated downwards several metres and the first few rows of the existing stands were removed. A new lower tier ring was constructed beneath and then with cantilevered struts providing the support, the existing stands that had now become the second tiers were extended outwards to overlap the new lower construction. Although the overall capacity of 50,000 remained roughly the same as prior to the work, it now featured just over 33,000 seats ahead of the World Cup. The effort was also rewarded with the stadium receiving the honour of hosting the Spanish national team for their three Group 5 matches, as La Roja qualified for the next phase in second position, behind Northern Ireland. Once more known as the Mestalla, the classic look established in 1982 still remains, although the stadium received a significant and spectacular facelift a couple of years ago, with seating replaced throughout to provide a more colourful look. 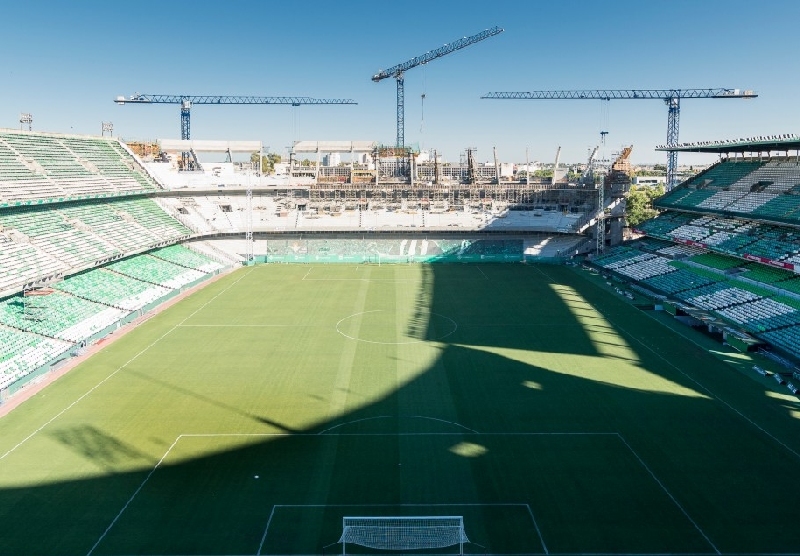 Interestingly, this measure was taken to extend the life of the historic home of Valencia CF, after work on a new stadium in the city was halted in 2009 due to economic difficulties. With the new stadium in perpetual limbo, the upshot is that we get to enjoy the magnificent Mestalla for more years to come.